See you at Forensics Europe Expo in London – where great things are going to happen! From Tuesday, March 5th – Wednesday, March 6th Amped will be at Forensics Europe Expo in Olympia, London. Forensics Europe Expo is dedicated to forensic science and is a primary meeting place for thousands of senior buyers looking to source the latest technological innovations on the market. Following 6 successful years, the 7th edition will – for the first time – take place on the same show floor as Security & Counter Terror Expo at Olympia, London. As part of UK Security Week, Forensics Europe Expo will connect together the industry’s entire supply chain and provide an all-in-one platform to engage with the most senior decision makers and procurement specialists. Attracting 1,500+ international forensics professionals from the Government, Law Enforcement, Laboratories, Private Sector, Military, Legal Sector, Universities and Intelligence Sector, Forensics Europe Expo 2019 will continue to be the most important forum of discussion and debate for the global forensics community. If you are at the event, or in the area, don’t forget to stop by the Amped Software Stand FE227 to see what we’ve been developing for the security and forensics community! This entry was posted in Announcements, Events on March 4, 2019 by Darlene Alvar. Watch this video to see what we added to the latest version of Amped FIVE (Update 12727) that includes Timeline, Multiview, HEIC support and more! This entry was posted in Announcements, FIVE, How to, New features on February 27, 2019 by Darlene Alvar. 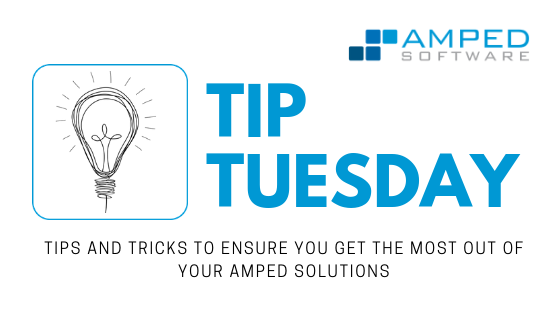 Dear Amped friends, welcome to this week’s Tip Tuesday! In our last Tip we’ve talked about how Amped FIVE users can save time by trimming and cropping the video they’re working on, so to focus the analysis only on interesting parts. Probably, we opted for that topic because February is the shortest month, and it may give you the feeling that time flows away too quickly. Since we can’t stop time, let’s at least save it when possible! This week is Amped Authenticate‘s turn, so let’s see how we can save time when investigating our digital images. Once more, it’s a matter of focus: to save time, we have to focus the analysis on the right images (i.e., properly select them) and run only the analysis filters that we need on them. We will focus on the first aspect today, and leave the second for a coming-soon Tip. This entry was posted in Announcements, Authenticate, Tip Tuesday on February 26, 2019 by Marco Fontani. We’re here with another update for Amped DVRConv, one of the fastest ways to cleanly convert multiple video files. Amped DVRConv remains one of the top go-to tools for practitioners who need to convert video quickly, cleanly and easily. 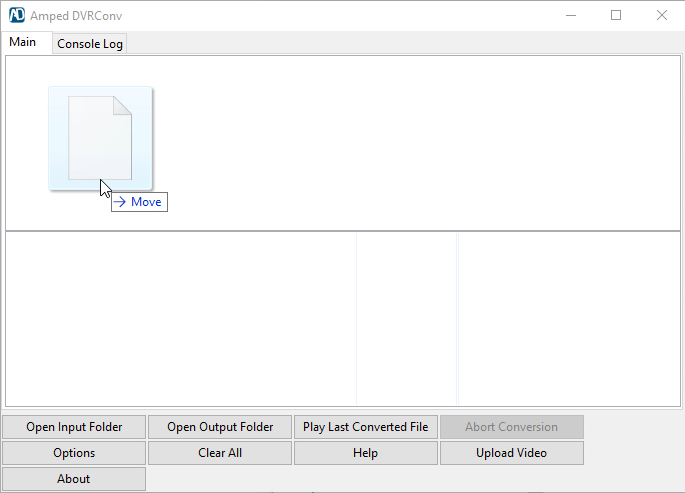 It’s my first choice when I have a large amount of video files that I need playable – I simply drag and drop my files into Amped DVRConv and it does the work for me in the background, while I am free to work on other processing! It’s also great if you are out in the field and need to convert video on the go, ready for when you return to the lab for input into Amped FIVE or to pass onto colleagues or other agencies. The great thing is, the original files are always preserved and log files created with each conversion, meaning your original video evidence is always kept secure. We know how many different standard and proprietary video formats are out there and how frustrating it can be to come across a new format that you just can’t seem to do anything with. For this reason, we are constantly working to add support for more formats that you send to us and in this update, we’ve done just that! This entry was posted in Announcements, CCTV/DVR formats, DVRConv, New features on February 22, 2019 by Lucy Carey-Shields. Trim, Crop and Watch Processing Time Drop! Digital videos are constantly getting more and more bulky. Nowadays it is not uncommon to work on CCTV footage with resolution above Full-HD, sometimes even 4k. Unfortunately, this huge gain in resolution is often frustrated by extremely aggressive compression (at the end of the day, the video must fit into a DVR hard drive). And there is one more collateral effect of working with hi-res videos: the processing time increases. Even if you are running Amped FIVE on a powerful computer, you may experience a significant slow-down when applying some filters to your footage. Remember that Amped FIVE processes your video in “live mode”: all filters in the chain are applied on-the-fly, and the result is rendered on the screen. If you feel the video is not playing fast enough, today’s Tuesday Tip is here to help you! 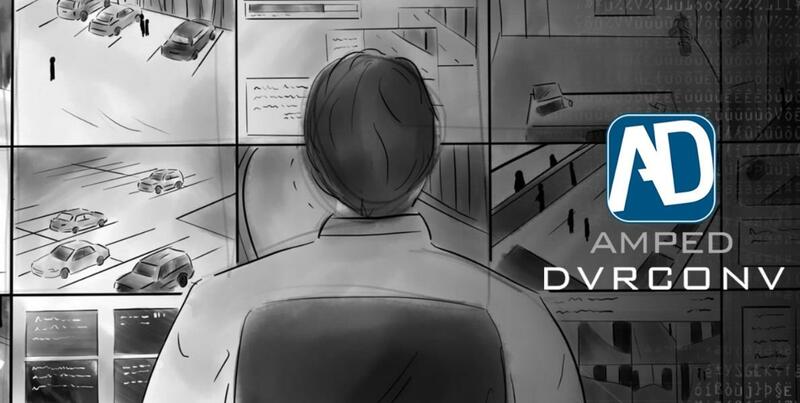 Our suggestion is to focus your analysis on the portion of footage that really matters, both in time and space. This entry was posted in FIVE, Tip Tuesday on February 19, 2019 by Marco Fontani. 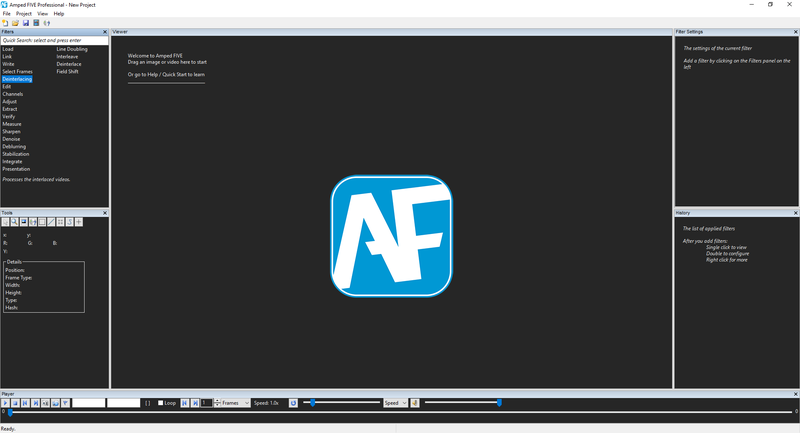 With the new year comes a new update to Amped FIVE with some exciting new features and a couple of brand new filters! 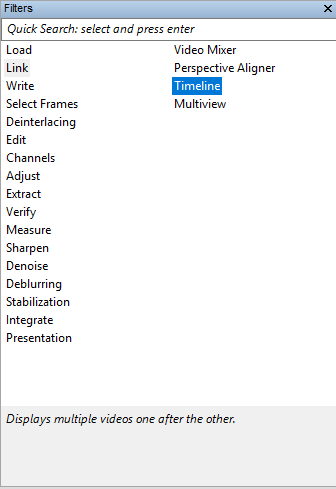 If one of your regular tasks is producing video for presentation purposes, you’ll be excited to know that there is now the option in Amped FIVE to combine multiple video chains together in our new Timeline filter, found under the Link group of filters. 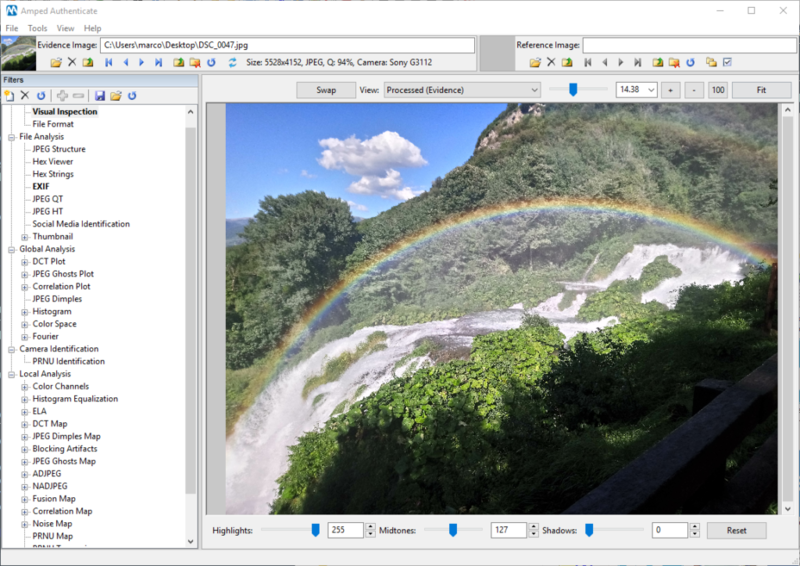 This entry was posted in Announcements, FIVE, How to, New features on February 13, 2019 by Lucy Carey-Shields. Log-Scale: A Great Ally for Plot Interpretation! Amped Authenticate users know how important it is to understand the processing history of an image, and they (hopefully!) know that “processing history” does not mean just splicing. when one of these happen you should be aware of it, as they bring important consequences to the rest of your investigation. Amped Authenticate offers many tools for processing history analysis under the Global Analysis filter category. Some of these, for example the DCT Plot, the Correlation Plot, and the JPEG Ghost Plot are… plots! They should be examined carefully, because we know that artifacts like a “comb-shaped” DCT histogram strongly suggests double JPEG compression, and so does a JPEG Ghost Plot with multiple local minima. The problem is… sometimes it’s just hard to see these artifacts, because they are “hidden” in the plot! 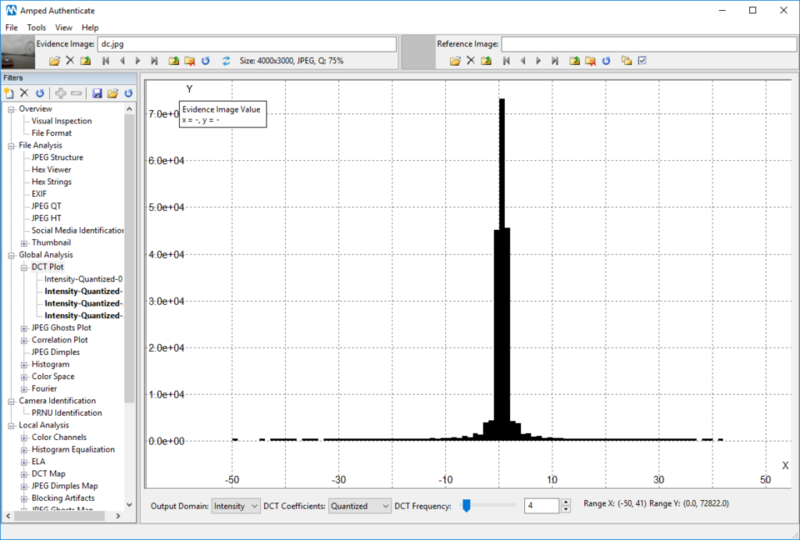 Consider the image below: at a first glance, its DCT Plot for DCT Frequency 4 seems rather “smooth”, and you could easily overlook it. This entry was posted in Authenticate, Tip Tuesday on February 12, 2019 by Marco Fontani. Static & Dynamic Tracking: never miss your object(ive)! Probably, Tip Tuesday aficionados have already understood the trend: we’re alternating tips for FIVE and Authenticate every week. Well… it is true. And it is intentional! Today we’re showing you some tips about tracking in Amped FIVE. Tracking an object is a basic, yet non trivial operation lying underneath a lot of Amped FIVE filters. You may want to track an object for annotation purposes, e.g. for having a red circle to follow the circled object as it moves. More frequently, you will be using tracking as a part of Local Stabilization, that is used to keep your object of interest static, so that you are able to view it better and effectively average its pixels over multiple frames. This entry was posted in FIVE, Tip Tuesday on February 1, 2019 by Marco Fontani. Did you know the Amped FIVE interface can be customized to fit your preferences? Perhaps you have two monitors and want to adjust the panels, or prefer a darker application theme? No problem! My personal preference is to use this layout, with the “darker” theme, as I tend to use only one monitor when using FIVE, but if you do want to re-organize the interface so it is more suited to your work style, each of the panels within the user interface can be moved or hidden from view. This entry was posted in FIVE, Tip Tuesday on January 22, 2019 by Lucy Carey-Shields.